The best part (other than the actual eating) is how simple they are to put together at the last minute. The dipping items: fruit and other not so healthy items, can be prepared ahead of time. And it look less than 10 minutes to make both of the fondue mixtures. It would be hard to do a day of fondue without ending it with a chocolate fondue. This was definitely everyone’s favorite dish (except Little A, but he was perfectly happy with his vanilla version). 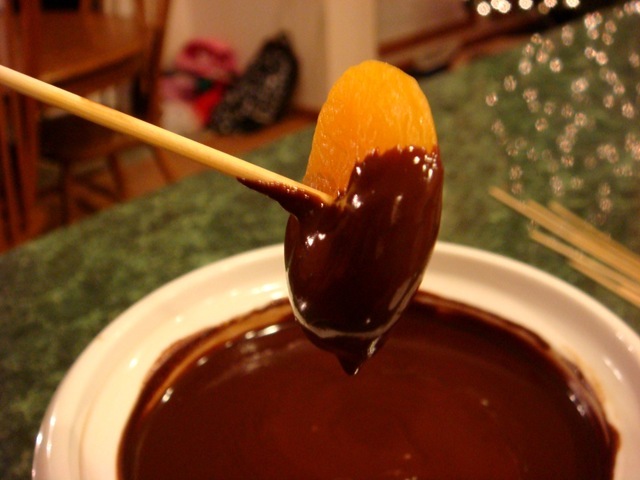 I made a Dark Chocolate Fondue, but you could easily adjust that based on what kind of chocolate you use. The recipe is embarrassingly simple: heat some heavy cream in the microwave, pour it over some chocolate chips (I used Ghirardelli Bittersweet), add some vanilla and a dash of salt and stir. The Vanilla Custard Fondue was only slightly more complicated, as it did require a pan on the stove. 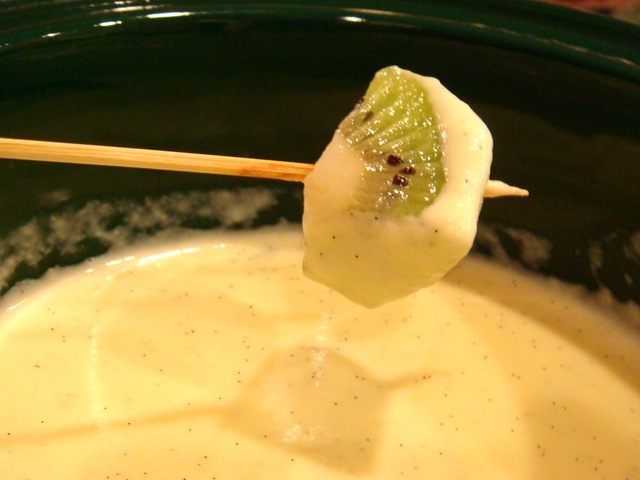 For this fondue, I adapted a simple stirred custard recipe. Normally it would be cooked, chilled and eaten as a pudding, but it was great warm as a fondue. 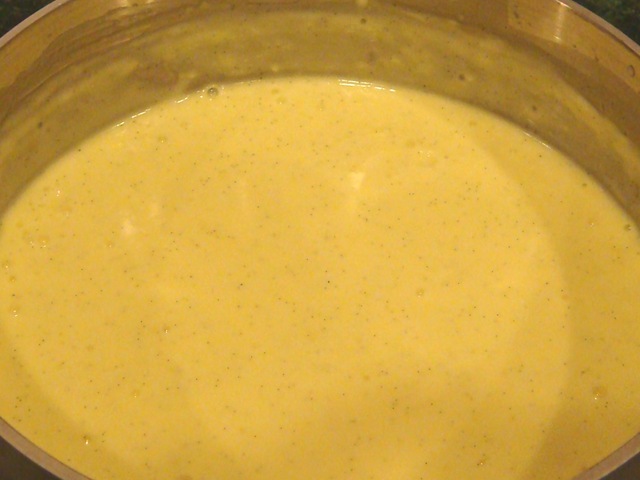 The custard is made by combining beaten eggs, cream, milk, sugar and a vanilla bean and cooking until the mixture thickens. I used two mini crock pots to serve these fondues. 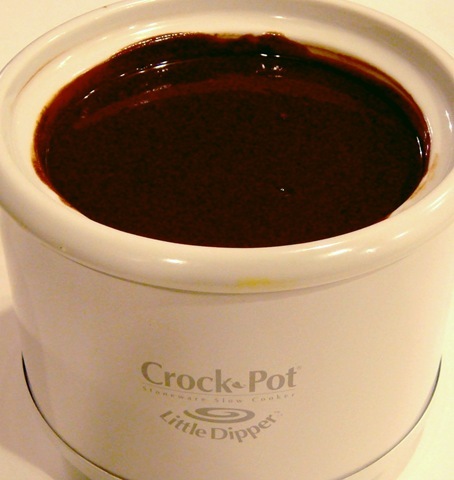 What to dip in dessert fondues? What can’t you dip! 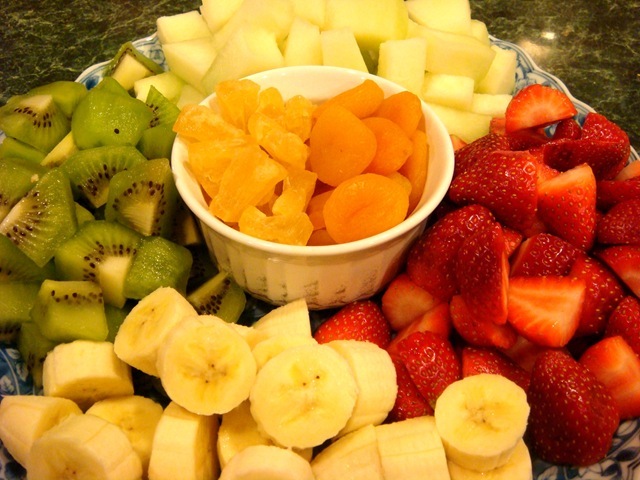 Fresh fruit is an obvious great choice (strawberries, kiwi, bananas, melon, pineapple, mangos), but don’t stop there. We also used some dried fruit (apricots are fabulous!). 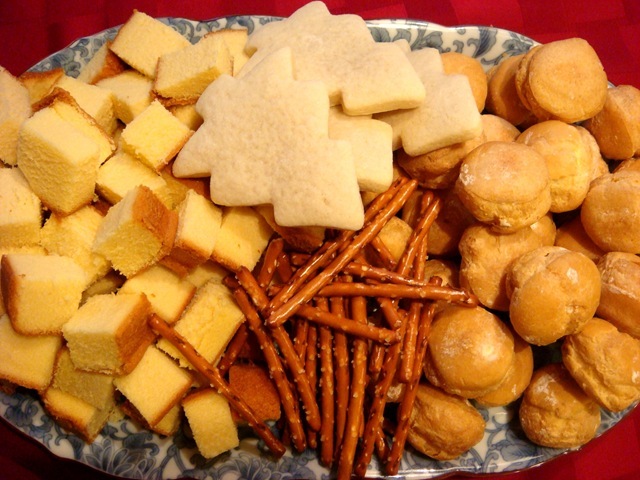 And then there are the not-so-healthy dipping items: cakes (pound cake or angel food cake), unfrosted sugar cookies or shortbread cookies, graham crackers, marshmallows, pretzels, and everyone’s favorite: mini cream puffs! Heat cream in the microwave for one minute (or on the stove for about 5 minutes). Pour over chocolate. Let stand one minute. Add salt and vanilla and stir until melted. 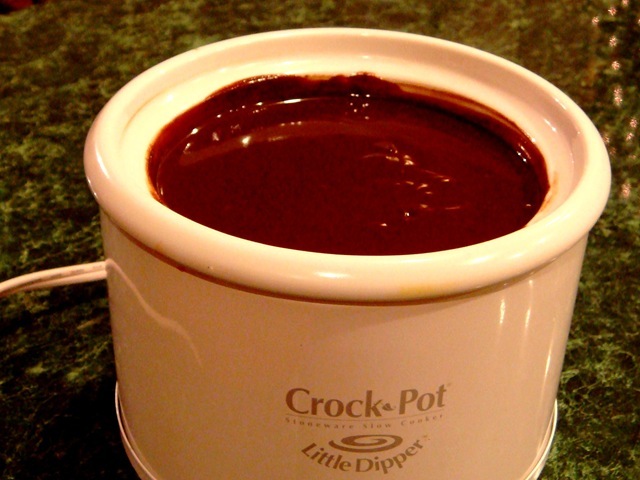 Pour into a mini crock pot or fondue pot. Serve with Dipping Items. Split vanilla bean and scrape seeds. Add bean and seeds with remaining ingredients in a heavy saucepan. Cook and stir over medium heat until mixture thickens. Remove vanilla bean. 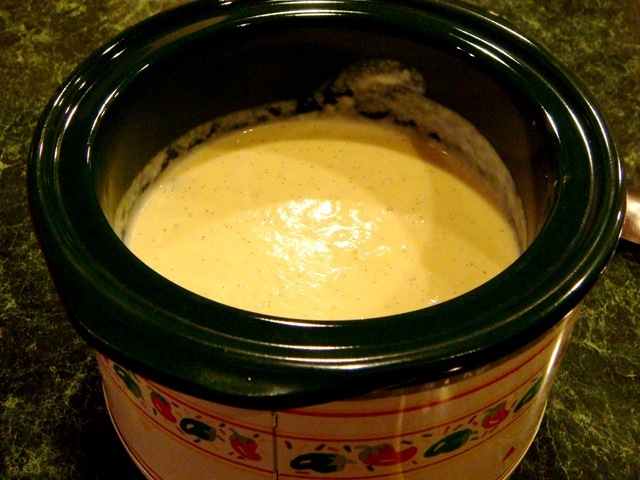 (Add vanilla extract at the end of cooking if not using vanilla bean) Pour custard into a fondue pot or mini crock pot. Serve with Dipping Items.